Finally, the monsoon has arrived here in Delhi. The MET department has announced that the monsoon has finally arrived in Delhi about 2 weeks in advance, and has covered almost all parts of India. I believe, monsoon is the only season, next to spring, which most gardeners like me, love. The blooms in the monsoons would be lovelier than ever. The flowers would stay fresh for longer durations, and most of all, it's time for my Tuberoses (Rajnigandha) to bloom. Yesterday, it started raining here in Delhi, and it's still going on today. While it was raining, I captured this one from my lame cellphone camera (lame, because my cellphone's not working properly and I haven't got any controls whatsoever, except, the dedicated camera button, that acts as the lifesaver for me. I've been using my cellphone camera to capture all my photographs, including all those in this blog (except the ones, I've quoted to have sourced from other sites). 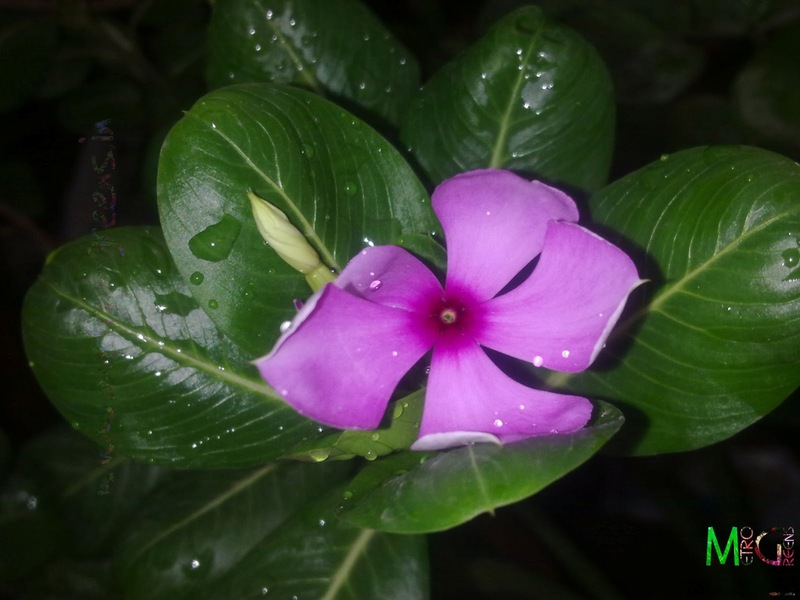 A bloom in one of my Vinca plants. Do share your thoughts about this capture of mine, if you like it. I'll be back with some interesting stuff. Till then, keep visiting and HAPPY GARDENING! wonderful. pink amid green .. makes it a fabulous capture !! Hello Jane, Thanks for visiting my blog and commenting. Frankly, I didn't expect a question like that. Seems like I'm too ignorant about the climatic conditions the world over. During the monsoons, there are a lot of positive changes in most of the plants, and a few negatives too. The positives includes fresh budding in many of the plants, and as far as I've understood it, this could be considered next to spring. Almost all plants and trees get new leaves, and many of those bloom during this time. It appears that the rains bring about, a new life in plants, which were subjected to excruciating heat during the summer months. The negatives include uprooting of trees in storms, that usually accompany torrential rains. In the upcoming posts, I'll try showing the plants during the monsoons in their full glory.